The very sad before picture. 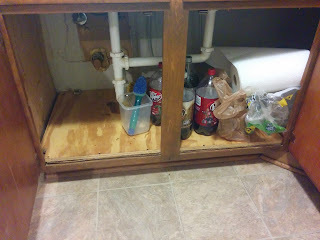 Our apartment has very few cabinets, so the area under the sink is prime storage space not to be wasted on cleaners. The warped bottom panel was replaced a while ago and I finally got around to tidying up. A free paper towel holder and 25¢ organizer I found at a yard sale make the most of the inside door space. Contact paper spruces up the unfinished wood panel. You know how I love Contact paper! I'm in the market for some new patterns. Has anyone tried Fancy-Fix brand? I love the aqua polka dot pattern and for $6 I'll probably give it a shot. Tool Tip: one of the reasons it took me so long to do this is my drill was out of commission. The chuck jammed in the open position. I consulted the internet and when that failed me, Dad. He suggested standing it chuck up, filling with good 'ole WD-40, and hitting it gently inside with a hammer and screwdriver after 15 minutes to loosen the mechanism. Worked like a charm! 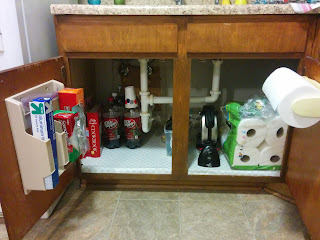 I hope you can find time to tackle a trouble area in your home this summer. My next big project will be some sort of entryway solution. My "system" of bags and piles is underwhelming.